Assorted tales of an information hoarder. This time he rambles on about a more simple life. As much as I love my digital and well-connected lifestyle, sometimes I really long for something different. Back to nature. Leave it all behind and start appreciating the sun again. Rain on my cheeks. Fresh air on my skin. Yes, just like Christopher McCandless chose to, in the movie Into the wild. What a fantastic picture this was, written by Sean Penn, no less. Romantic, haunted, but also a cautionary tale: you might want to leave society, you can even do so, but it will be at your own risk. Don’t think for a second it will be a walk in the park. Or will it? The main problem McCandless faced wasn’t so much nature, not in my mind. It wasn’t even the bear. Humanity has conquered nature before. There are startling tales of hardship and survival all over the world. Even more: if we as a species hadn’t been able to master nature, we wouldn’t have managed to survive the way we did. In these numbers. At such environmental costs. No, if McCandless had been just a bit more prepared and a bit less romantic, he might have made it. A bit less stubborn goes a long way. A bit more knowledge too. Come to think of it: he should simply have read a bit more. Survivalist manuals, for starters, like the ones I collected in my youth. This was back in the rugged South of my country, a hidden corner of a village, close to the border with Belgium. Lots of trees around, and heathlands where we could roam unsupervised. With a little pocketknife and a stick, we knew we were great explorers. We spotted hares, caught trumping bullfrogs and set them free again when it was time to go home. Unharmed, because that’s what these manuals taught us. Respect nature, and it will respect you. Respect nature, and it will respect you. In my mind, there was nothing unhealthy or anti-social in my desire to lead a more simple life, to return to nature. It felt like connecting from a more comfortable distance. Like waving to someone on a train. Calling long-distance. But distances no longer exist anymore, I’m afraid. Even my Beloved wears an Apple watch now. Whenever there’s a message, breaking news or even when it’s only time to stand up, it vibrates on her wrist. It monitors her heart rate, as she walks the stairs or when she drinks the tall glass of water the watch reminds her of. It knows exactly where she’s located on this planet, and therefore I do too. We both use Find My Friends. No more getting lost in the wilderness. The American Cover of The Eight Mountains. A great read! 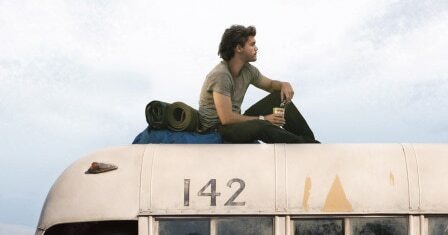 I knew I was not the only one who ever saw and liked Into the Wild. I also believed that I couldn’t be the only one who longed for a simpler life, a bit more easy on the eyes. And then I read a much prized and hyped novel, that’s continuing to sell very well in my country: The Eight Mountains. In one of his interviews its author, Paolo Cognetti, confesses that he saw Into the Wilde, just like me. But where I just went home afterward, Cognetti changed his nomadic lifestyle, traveling between New York and Milan, and started living in the mountains to dedicate himself to his writing. Now he’s a montanero, a mountain-dweller. 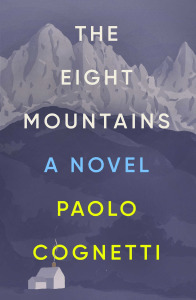 The eight mountains is a moving novel about living under the strain of a demanding father. It introduces its readers to the Italian Alps, where a particular breed of Italians chooses to spend their summer holidays. There’s friendship to be found there, but also solitude. Melting glaciers. Strong, stubborn men confronting a harsh environment. If it were up to me, I’d know where to spend my summer holidays. But what if we found out, there’s no wifi up there? And no reception either?